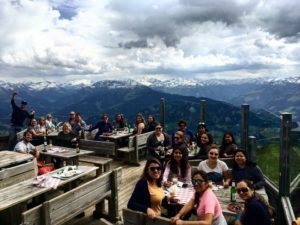 I just returned from an amazing trip to Europe with Contiki, we visited Munich, Germany; Lauterbrunnen, Switzerland; Hopfgarten, Austria; we also stopped in Lucerne, Switzerland and Liechtenstein. In Munich we took Mike’s Bike tour around the city. Munich is a very walk-able city but seeing it from a bike is much more fun! We stopped in Marienplatz and watched the famous Glockenspiel at noon. As we made our way through the city’s busy streets, we past Government Offices, war memorials, the National Theater and the beautiful Theatin Church. Our creative tour guide was very knowledgeable and full of energy! When we passed a statue that was being refurnished, he had some of our group demonstrate what it should look like, 2 lions, a king with his wife and a couple other guards on either side. It was a fun way to learn about the history! The bike tour stops in the English Gardens at the Chinese Beer Garden for a stein of Munich’s finest beer and a pretzel for lunch. 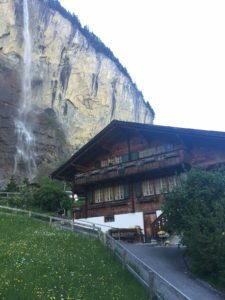 Our next stop was Lauterbrunnen Switzerland, the town of many waterfalls. It is a very small town with only a couple of hotels, shops and a campground. Honestly, one of the most beautiful towns I have ever been to. The waterfalls in the backdrop, cows grazing through the fields, chalet style houses nestled in the hills, it is the perfect Swiss town! To wake up every morning with the fresh mountain air blowing in your window is such a great feeling! 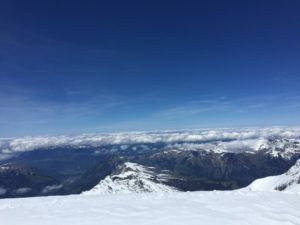 For our full day in Swizerland, we took the train up to Junagfraujoch, the highest rail station in Europe at 3571 meters. The journey is about an hour and a half each way. Once you arrive at the top there are many things to keep you busy, like skiing and the snow-fun park in winter. You can walk through the ice castle, take a glacier hike up to a tea house or choose to stay indoors and check out the neat displays, unique shops and restaurants. Don’t forget about the amazing photo opportunities, the views are stunning everywhere you look! It does get cold up there, so make sure to dress in layers! 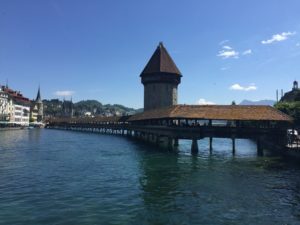 As we left Switzerland, we had a quick stop in Lucerne and Lichtenstein on our way to Austria. In Lucerne we had time to pick up Swiss chocolate, Swiss Army Knives and a watch or two for souvenirs! We walked over the famous Kapellbrucke (Chapel Bridge), it is the oldest wooden covered bridge in Europe. Another must see while visiting Lucerne is the Lion Monument, it commemorates the Swiss Guards who were massacred in 1972 during the French Revolution. We stopped in Lichtenstein for lunch and to admire the beautiful castle overlooking the capital city of Vaduz. Lichtenstein is a small country on the boarder between Switzerland and Austria. Vaduz has a few souvenir shops, restaurants and cafes as well as a tourist office where you can get a passport stamp for 5 Euro! We arrived in Hopfgarten later that evening and had a quick walk into the town. For our full day in Hopfgarten we had 3 amazing activities planned, first was the 25 km mountain bike ride. 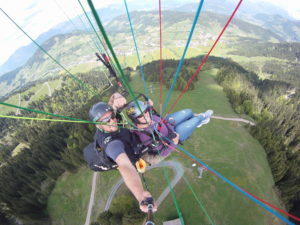 This is a great way to see some of the Austrian scenery and countryside. It was a difficult ride but 95% of our group was successful. For the first half we rode a slight but constant uphill path winding next to a river through the valley. Once we reached the highest point in the ride, we were happy to see the huge downhill all the way back to our guesthouse where lunch was waiting. What a blast! After lunch, we were all shuttled to our paragliding excursion. This is something that has been on my bucket list for a couple years and it exceeded my expectations! The flight lasted about 20 minutes soaring over the valley, you could see for miles on either side of the small town. It was such a thrilling experience, I wanted to go again after we landed! Our final activity for the day was the cable car to the top of the ski hill, we enjoyed a beer and celebrated a birthday with one of our fellow travelers. The restaurant at the top has a revolving patio, over an hour you will do a complete circle. If you feel adventurous, you could bring your bike to the top and ride down. On our last full day in Europe we were heading back to Munich with a couple stops on the way. 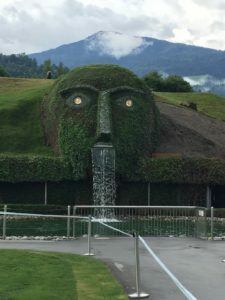 First stop was the Swarovski Factory and Museum in Innsbruck, we had time to go through the museum and do some shop. 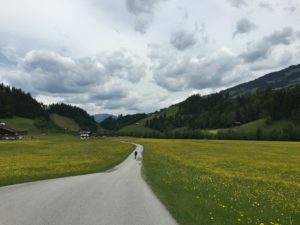 There are lots of unique pieces that are only available in Austria to take a look at. We were surprised a glass of sparkling wine and a gift in their VIP lounge. What a way to start off our last day! 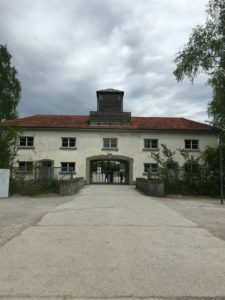 Our next stop was Dachau Concentration Camp, just outside of Munich. It opened as a work camp in 1933 for anyone who spoke up against the Nazi party. People died because of overcrowding, famine, exhaustion and disease, it was not an execution camp. The German Government realized their mistake from WW2 and camps like this are open for the public to learn about what happened here. It was a very somber experience to walk around the camp, the living quarters and barracks are still in tact. Most of the sites have been rebuilt to show how it was originally set up in 1933. There are plaques and information boards throughout to educate visitors on what they are seeing. I would suggest visiting on your own time, don’t take a guided tour just walk through at your own pace. It is a very emotional experience. For our final night in Munich we had a traditional meal of pork knuckle at the Haxnbauer Restaurant. Then we made our way to the famous Hofbrauhaus to enjoy a final farewell drink and say goodbye to our new friends. The Hofbrauhaus is one of Munich’s oldest beer halls serving beer by the liter, pretzels and traditional German meals. 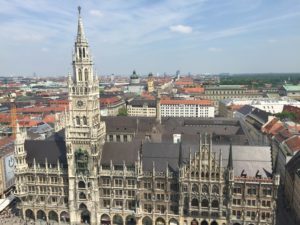 It is a must see if you are visiting Munich.